While it may not be quite as efficient as the XC25, the Lennox XC20 is extremely quiet, ultra-efficient, and utilizes the same 65-speed compressor found in its counterpart. The XC20 is part of Lennox’s “Elite” family of products, or “Better” if you consider it from a good, better, best standpoint. All new air conditioners installed in Arizona are required by the U.S. Department of Energy to be at least 14-SEER. New AC units 16-SEER and above are considered very efficient, 18- and above ultra-efficient, and 20-SEER and above extremely-efficient. In other words, while Lennox may only classify this as one of their “better” units, it actually competes with some of their competitors best. If you were replacing an older 10-SEER unit with the XC20, you can expect to see an approximate 50% savings on your cooling cost! That said, at Magic Touch Mechanical we often advise our clients not to buy a new air conditioner based on efficiency alone. An air conditioners job is to keep our home comfortable, and the XC20’s design and components do just that, with it’s variable speed compressor discussed in the next paragraph. 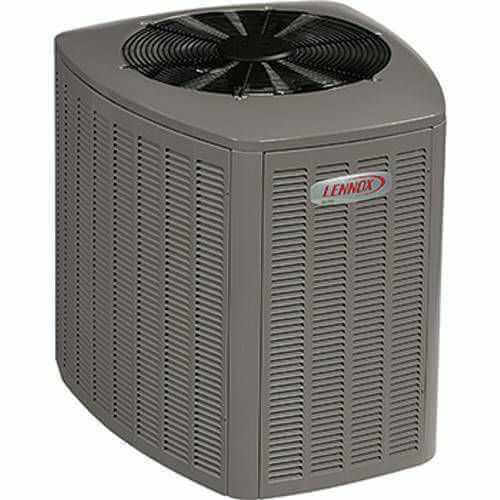 The Lennox XC20 AC unit has earned Energy Star’s “Most Efficient” designation (compared to competitor brands). Lennox advertises the variable speed compressor in the XC20 as “65 air conditioners in one”. What they mean by that is the compressor is capable of running at 65-different speeds. Digging a little deeper, the compressor can ramp down to 35% of it’s total ability in 1% increments. Or, it can ramp up to 100% (it’s highest speed) on extremely hot parts of the day. It’s easy to see why only using the exact amount of capacity needed at the time would make it more efficient. To better understand how that makes everyone in the home more comfortable, think about a standard single-speed (on/off) AC unit. A single-speed AC unit turns at 100% unit it reaches the thermostat set-point and turns off. When your home starts to heat up, it does it again. A variable speed air conditioner however ramps up and down to match the conditions at the time, never allowing your home to warm up too much, and never freezing you out with too much. This ability allows the unit to always maintain the temperature in each room to within one half of one degree 24/7. Is the Lennox XC20 Quiet? If you read our product description of the Lennox XC-21, you see the story of our installers telling us the very first one we ever installed was “silent”. That unit is measured as low as 69 decibels. The Lennox XC20 is even quieter with decibel ratings as low as 65dB! The major difference being variable speed compressors by their very nature operate quieter than two-speed compressors like the one found in the XC21. In fact, at 65db the Lennox XC20 is significantly quieter than the majority of air conditioners on the market today. When you choose Magic Touch Mechanical to install your new Lennox XC20, we include a Wi-Fi thermostat. The Lennox iComfort Wi-Fi Thermostat allows you to use your tablet, smartphone or other web connected device like a remote control right from your favorite armchair. Or, you can use it from the other side of the world. If you want the best of the best, choose the Lennox S30 Wi-Fi Ultra-Smart Thermostat upgrade. This full-color thermostat is may look like the cockpit of a 747, but it couldn’t be simpler to use. Most people say it looks and feels like using an iPad – in other words it’s pretty and user freindly. Check out the Lennox S30 on our THERMOSTATS page. One of the best features exclusive to the Lennox S30 is the “feels like” feature. The “feels like” feature is similar to the “wind chill factor” and “heat index” we see on local weather reports. It takes into account the humidity, temperature, etc. to provide precise comfort for you and your family. IMPORTANT: New AC unit warranties require product registration within 60-days of installation or coverage is reduced. We register the equipment on our clients behalf just to be safe, but not all contractors do. Technically it’s the consumers responsibility to register for the warranty coverage, so if you live outside of Arizona (Magic Touch’s service area) make sure to register right away. With registration this model has a 10-year limited compressor, coil, and parts warranty. If not registered within the timeframe the warranty reverts to a five year parts warranty. We make it pretty clear throughout this website that we are big fans of variable speed air conditioners in general. They make a lot of sense, especially in our service area (Phoenix, Mesa, Chandler, Glendale and surrounding cities). It’s also pretty plain to see we are Lennox fans and have been recommending their products for many years. The XC20 has a little bit of everything we love about Lennox’s innovative design. More importantly, it’s very efficient and very quiet – two things that top most peoples importance list. If you think Lennox is right for you, and variable speed is right for you the Lennox XC20 deserves consideration. If budget allows, you should also consider its big brother the XC25 which is the pride of Lennox’s stable. If the XC25 is not within reach, don’t hesitate selecting the XC20 – it puts a lot of its competition to shame and our clients who own them are very happy with their choice. How Much Does the Lennox XC20 Cost? Choosing a new cooling and heating system is a choice you will have to live with for a very long time. We work in thousands of homes around the Phoenix valley each year and unfortunately see the discomfort, aggravation, and expense their owners deal with when the whole “system” was designed and installed improperly. Don’t Compare Units – Compare Installation Contractors! Besides two free maintenance and cleaning visits, an ACCA approved Manual J heat-load calculation, optimized airflow design, and more, here are some of the things that set a Magic Touch Mechanical installation apart from the others: What’s Included With This Installation? As you might have guessed, the most efficient two-stage AC unit on the market today is not inexpensive. However, the Lennox XC21’s perfromance and specifications justify the spend for anyone with the budget to own one. Prices vary around the country but you can probably expect to pay between $9,000 and $11,500 including tax* before manufacturer, utility, and contractor rebates or promotions. *Depending on size, model, upgrades chosen, application, ducting, and ancillary items needed.